My love for the dearly-departed Party Down is well-documented – last year, on the eve of its cancellation, I wrote a post about I thought it was one of the most honest television shows about the disconnect between expectations and reality in your 20s. Beyond that, its a show that consistently and repeatedly makes me laugh out loud, even when watching episodes I’ve seen a dozen times. Which is how I happened upon one of my favorite scenes, pictured below. I’m in a very different place than I was at this time last year – I’m in a new city with a full-time job and a very different life – and yet, I still find myself relating to Henry’s cynicism and self-defensive misanthropy. I may not be popping pain-killers on the job, but much like Henry, I find solace in a stiff drink when I start to look too closely at all the ways life seems a little incomplete. It’s not that anything is broken, but sometimes I feel the cracks in the foundation. 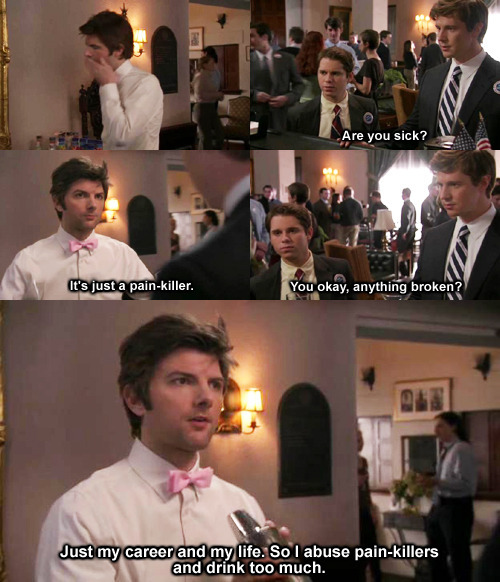 I’m a big fan of the television show Party Down. It features a great cast, clever dialogue, and a rotation of guest star performances that rivals anything on TV right now. If you’ve never seen it, check it out on the Starz website or you can stream both seasons on Netflix Instant. The second season started shortly after I found myself unemployed and a little lost. While I loved the show from the get-go, I found myself really drawn to it as workplace dramedy. While it has a lot of hilarious moments, it’s also a very bleak and realistic representation of what the working world is like for a lot of people in their 20s. Casey – Pursuing her dream job but finding herself jaded and hurt by the frustrations she keeps encountering. Toils away at a meaningless job to pay the bills. Kyle – Desperate for anything closely resembling his dream job. Willing to degrade himself and sell out if it means financial wealth. I’ll tell you exactly where I fall. I relate best to Henry – the idealized version of my career path that I had when I graduated didn’t work out as planned. I became disenfranchised with the plan I had created for myself. So, I’ve taken a step back, juggling a few jobs that are not exactly what I had in mind when I took out student loans to pay for a college degree. I don’t necessarily think being a Henry is a bad thing. I won’t spoil the show for those of you who haven’t watched, but the trajectory that Henry is on is one that ultimately I think is healthy and normal for someone in their 20s dealing with career changes and shifts in perspective. When I watch the show, I’m not only laughing at that week’s ridiculous party concept or rooting for the Henry/Casey romance to work out but I’m also hoping that each character makes that dream job a reality.